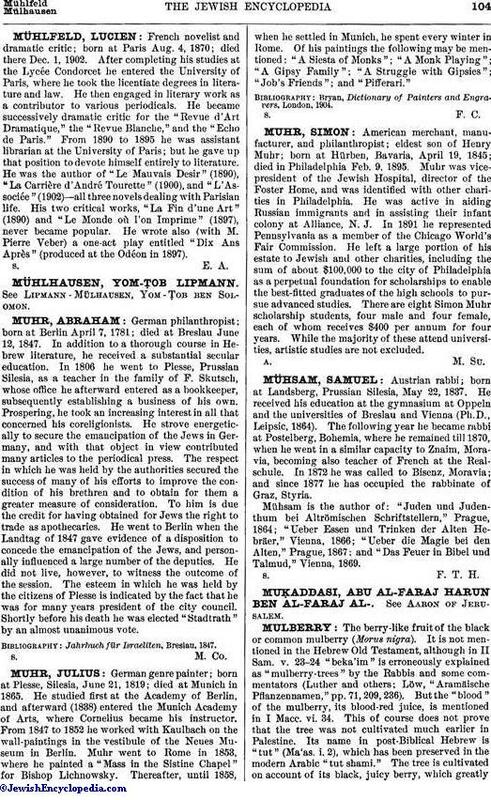 American merchant, manufacturer, and philanthropist; eldest son of Henry Muhr; born at Hürben, Bavaria, April 19, 1845; died in Philadelphia Feb. 9, 1895. Muhr was vice-president of the Jewish Hospital, director of the Foster Home, and was identified with other charities in Philadelphia. He was active in aiding Russian immigrants and in assisting their infant colony at Alliance, N. J. In 1891 he represented Pennsylvania as a member of the Chicago World's Fair Commission. He left a large portion of his estate to Jewish and other charities, including the sum of about $100,000 to the city of Philadelphia as a perpetual foundation for scholarships to enable the best-fitted graduates of the high schools to pursue advanced studies. There are eight Simon Muhr scholarship students, four male and four female, each of whom receives $400 per annum for four years. While the majority of these attend universities, artistic studies are not excluded.